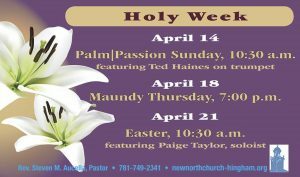 As it is for most churches, Holy Week tends to be a very busy time at New North Church. 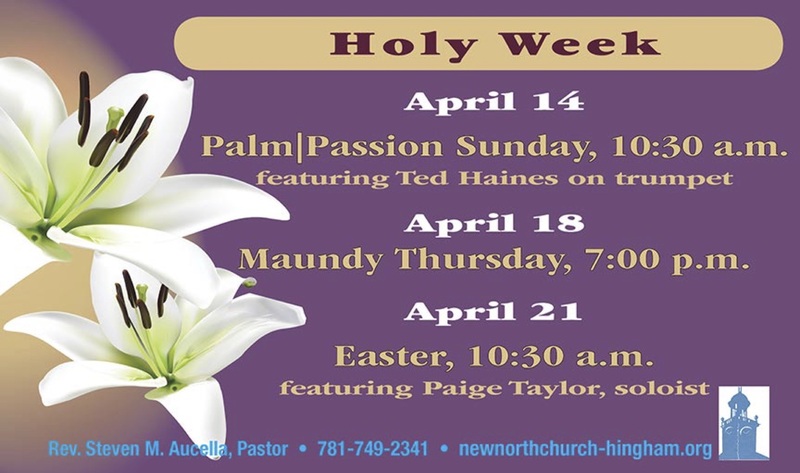 At the 10:30 a.m. service on Palm Sunday, April 14, Ted Haines will be playing trumpet in the choir loft as he has on Palm Sunday for more than fifty years. He will be accompanied by William Thayer, a long-time member of the church, and by Cathleen Morrison, the church organist. The service begins on the front steps of the church with everyone holding palms, and processes into the sanctuary to commemorate Jesus’ entry into Jerusalem. The service soon moves into the Passion of Jesus – his betrayal, arrest, and crucifixion. Easter Sunday, April 21, is completely different. First, Paige Taylor returns as soloist. Ms. Taylor is a soprano who joined the South Shore Conservatory voice faculty in 2017 and is currently the Choral Director at Falmouth High School. Bill Thayer returns on trumpet as well, and the entire service is boisterous (almost) from the beginning. It is not unusual to find Easter eggs filled with jelly beans hidden in the pews.